I've never been to the desert. Sure, I've traveled to Moab in Utah, and parts of Arizona, but I've never experienced the feeling you get when you look into the distance and all you see across the horizon is sand dunes. I went on a magical Desert Safari in Dubai. My first experience was nothing less than spectacular. Adnan and Agha picked us up in front of our hotel and whisked us off to the mysterious desert. With the lights of Dubai in the rear view mirror, we started chatting. I quickly discovered that not only had no idea what a 'safari' entails, but also clueless as to how I was going to be spending the next 8 hours! We started the tour with dune bashing, a term used for off-roading on the sand dunes in the desert. I think the best way to describe it is like riding a rollercoaster, with a little less certainty and a lot more fun. Adnan, our driver, is a certified dune basher and he expertly navigated the shifting sand with the SUV. As the vehicle slips and skids, you're thrown every which way for an exhilarating experience. I loved taking my sandals off and feeling the sand between my toes. It's like being at the beach, without the water. 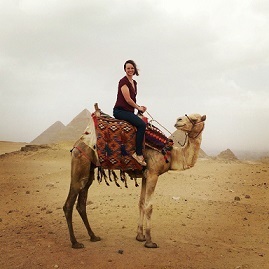 What's an Arabian Desert trip without a photo op? Agha let me climb on top of the SUV for a few photos, and I used the opportunity to show off a few yoga moves. My friend, Arantxa from Mexico, and I did the quintessential jumping photos, which hilariously took many takes to perfect. After our thrilling dune bashing experience, we drove to a camp where even more activities awaited our arrival. Arantxa and I hopped on ATVs and accelerated through the sand. At first, I was a little apprehensive about it, but after my first loop I got into the groove and began cruising around the track with speed. An Arabian Desert experience can't be complete without a camel ride. Both Arantxa and I had been to Cairo before and ridden camels, so though I can't say we are 'seasoned camel riders,' we knew what to expect. The two of us boarded the strongest beast. After you ​mount a sitting camel, you think, "This isn't too bad." But then, you think about how tall camels really are and you wonder how in the world you'll make it up that high? If you lean far back it helps to counteract the movement of the camel first getting on its hind legs, then hoisting itself up to all fours. There is always a split second of panic when you realize how high up you are, but it quickly passes as the lulling of the camel's gate puts you to ease. One of the belly dancers! It quickly got chilly after the sunset and we quickly made our way to the Bedouin-style camp. Fortunate for us, we had the VIP Package with Happy Adventures​, which meant that all of our days activities were included and we received table service and shisha! This was lucky for us, because I was starving from all our adventures and didn't have to wait in line. The festivities began with two different types of belly dancing. It's hard not to become mesmerized by the smooth precise movements of the dancers. Due to my special VIP treatment I got to go backstage and take a photo with one of the belly dancers. I have to say, we have very different body types.... After the curves left the stage, a man in a brightly colored skirt came out to perform a Tanoura dance​. The man uses his movements to tell a story and spins in circles so many times it's difficult not to be transfixed by the dance. The show was concluded by a man that could manipulate fire. He would eat it, touch it, and spin it dangerously close to his body. It makes sense that he didn't have any hair. Right before the end of the tour, Arantxa and I got Henna tattoos on our hands. The woman gracefully drew the designs with such speed, it took less than 2 minutes for her to work from the end of my ring finger past my wrist. I was in awe of her skills. I struggled to fight sleep on our drive back to Dubai, but the beautiful lights of the city were rejuvenating. Happy Adventures ﻿entertained us for hours in a luxury setting. A trip to Dubai isn't complete without exploring the Arabian Desert.